A grand jury in Houston studied all the evidence in the case of the anti-abortion extremists who claimed to have shot video proving Planned Parenthood was illegally selling fetal tissue and body parts for profit. They not only determined that Planned Parenthood was innocent of all these horrific charges but that the two principal anti-abortion activists who shot the video, David Daleiden and Sandra Merritt, committed criminal acts in the pursuit of smearing Planned Parenthood in this scheme. What would you expect the reaction from Republican Presidential candidates to be, in light of how quick they were to condemn Planned Parenthood after this fraud was perpetrated? You guessed it, they declared that they are not only anti-abortion but they are anti-justice and pro-criminal. Well…at least I agree with Rubio on one thing, he is disturbed. Carly, here’s what I know, you have been the only one trafficking in body parts…fictional ones that is, to boost your pitiful campaign…but you’re at 2% nationally. No wonder you support lies, criminality and whatever it takes to try and stop abortions, this will be your second aborted campaign. Oh Huckster, why am I not surprised that the defender of Kim Davis who violated the law to push her bigotry against gays would beat his chest over the sins of juries telling the truth about the innocent and holding criminals responsible for their acts? If such things seem sick to someone, maybe it’s that person who needs a doctor. The party of Patriots? Seems more like the party of Juvenile Delinquents. Thank you for the great article, AdLib -- The hypocrisy of these GOP Presidential candidates is indeed beyond despicable. Looking forward to seeing DaLIEden in handcuffs, may true justice prevail against his crimes. There have been 12 other GOP state investigations into PP, all showed no evidence that PP had done anything wrong. Despite the facts, these candidates continue to proclaim and perpetuate fraudulent anti-abortion rhetoric. Actually, the private reproductive healthcare decisions of women in Arizona are NONE of his business! Not surprising that GOP can’t accept a court ruling that has been obvious to everyone else. The are the same people who can’t accept that they lost the Civil War, and have been on the wrong side of everything ever since. Brainwashing only works for some, some of the time. Brainwashing a majority of the nation, forgetaboutit. The facts are there. Planned Parenthood do not sell body part, and yet the dishonest fantasy goes on. Benghazi. Kenyan Muslim. The Muslim Brotherhood infiltrating the White House. The president taking away their guns, etc. It’s amazing how willingly some are so easily led even when they are being used and lied to right, left and centre. This is “white privilege”. No matter how bizarre their chosen politicians become, they will follow no matter the consequences and trail of unfulfilled promised. Some because they want to fit in. Some because their hate is toxic and they need to feel validated. Some because it’s easier than forming an opinion. Like the Bundy bunch, they have no respect for any laws, have no conscience and are happy about destroying any signs of morality and sanity. These people have the audacity to call themselves Christians when there is nothing remotely Christian about them. These are the people that Jesus would scorn and throw out of the temple. What happens when they lose? They will become eben more bitter and teach their next generations how to hate and lie. The sky is blue. No, the sky is green. I mentioned “white privilege/entitlement” in a reply to you, didn’t see yet that you nailed it here! The problem with these damaged human beings is that they NEED to believe the worst things about people that disagree with them. To the lesser educated, insecure people, it is too threatening to their security to be open to the possibility that the opinions they have blindly adopted from the authority figures they depend on to tell them how to think, could be wrong. So they are anti-intellectual of course and must justify the demonizing of everything that doesn’t support the world view that’s been stamped into their brains. No wonder they don’t believe in evolution. So they’ll rationalize why it’s okay for the anti-Planned Parenthood frauds to have committed crimes to destroy Planned Parenthood, they’ll support the immoral bigotry against Muslims, they’ll applaud the portrayal of an entire country’s people and their entire race as “criminals and rapists”…they have and continue to stoop to the most immoral beliefs while perceiving themselves as superior in morality. It is a dichotomy and in the end, a product of the lack of education. As they say, knowledge is power and through the gutting of public education by Republicans cutting taxes and spending on educations, they are helping produce a larger population that is uneducated and unable to use critical thinking to make their own decisions and conclusions on issues. So of course, they are more susceptible to looking to authority figures like Fox News and Rush Limbaugh to figure things out for them and tell them how to think. No one who is well educated and well adjusted requires an obnoxious, chauvinist, racist drug addict to tell them how they should think. But those who feel insecure about being smart enough to figure out truths for themselves are a very different story. Another excellent article Adlib! Reading the quotes you have placed in your article shows just how often republicans use spin to change the subject to one they can support. Abortion as we know is one of the mainstays of the republican party, and we also know that the reason this is true is because their evangelical wing along with the Tea Party puppeteers know they can control those that still interpret the Bible from the Old Testament point of view and in a manner that will help keep their bottom line in the black. Marco Rubio’s I’m disturbed but, says it all. He acts as though he might be upset at what the horrible imposters did with their “PP report,” but then dives into the talking points those of his ilk use to continue to play to their TP and Evangelical wing. Carly Fiorina uses the same slight of hand or should I say the same manner in which she tries to confuse the reader/listener as to which direction she is going, but only for a second, nice of you to remind us that her campaign is circling the tube, and should be out of sight soon. Thank God for that. Mike Huckabee is, I believe, exactly what the Bible speaks of when you read the warning to beware of false prophets. He is the worse clergyman I believe I have ever seen in politics. Huckabee is a male version of Palin in my opinion. Both are dangerous, both play to the same ignorant base, and both should be under psychiatric care if we believe in mercy for the criminally insane. 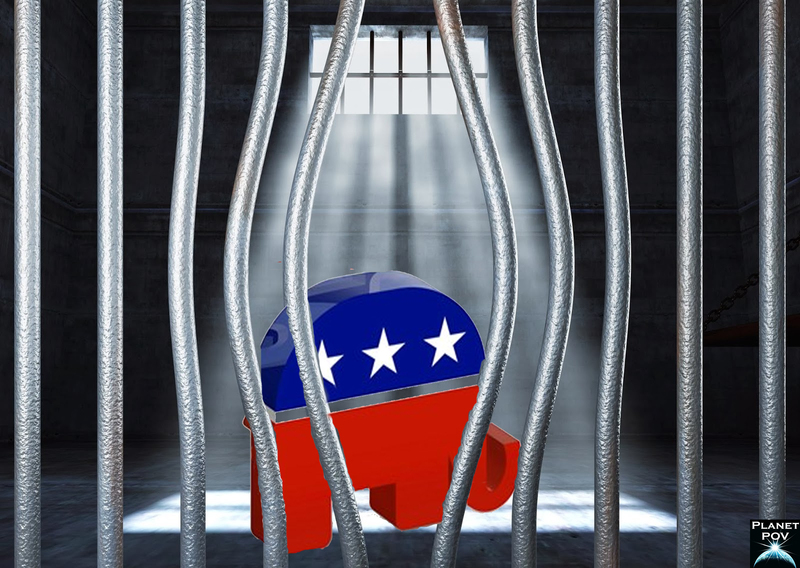 Republicans have supported criminality since the party changed from its democratic roots to this conservative thing we have today that is being run mostly by the plutocrats (billionaires) of this country and other parts of the world. We in my humble opinion as a nation are in serious trouble right now. I believe what we have is two political parties that are filled with politicians who for their own personal reasons, those reasons mostly adding up to the same thing, money and power, are leading their electorate around as though they were sacrificial lambs only capable of being utilized as a sacrifice on the altar before the billionaires so that the powers that be, the billionaire club, can recognize, approve of, and eventually appoint them, the politicians, as Lord or Lady or Overseer or whatever title they tend to be after at the moment. We are at a crossroads, and I believe this election is going to decide if we take the correct road or lose our democratic republic. Thanks for the thought provoking article and the opportunity to express my opinion. Thanks for your kind words, monica! What gets me is the holistic hypocrisy of the GOP. It is global for them. They pound their chests about fighting for morality on all the social issues but they encourage and champion immorality as a means of attaining their “moral” goals. Out of the ignorance of self-righteousness, they want so badly to force their religious beliefs on all Americans and relegate women back to the role of helpless baby makers of 2,000 years ago that they will lie, defraud and break laws to accomplish that. What belief do they have that isn’t hypocritical? They claim they are pro-life yet support executions, wars and police murders of unarmed African Americans. Do they really not know that all of those innocent people killed under policies they support were once “unborn” babies? How can someone be pro-life when they stop protecting the life of a baby the moment it’s born? I think the whole Trump phenomenon is directly related to the GOP being merely an arm of the plutocracy. For decades, the GOP has treated its voters like rubes, promising them everything they want in campaigns while knowing that the only things they’ll do when elected is make the wealthy wealthier at the expense of everyone else. Now Repub voters finally are understanding that they have just been played for fools and supporting Trump and Cruz is there way of rebelling. Thankfully, this is a Repub “thing” so Trump will only dominate within the GOP and can’t win in a GE. Dems like their President and the many promises he has kept so they’re not looking for a plutocrat in populist clothing. While many Dems do support Bernie for a related reason of opposing the plutocratic forces, they will support Hillary if she became the Dem nominee. Truly, I am not concerned at all that Trump could win the Presidency. He needs around 50% of the Latino vote and a majority of the women vote to win. It just isn’t going to happen. And a reminder, Trump has not really been hit by negative campaigning and advertising, as he will when the GE starts. Think about how much horribleness from Trump’s mouth the public could be reminded of and it’s only inevitable that his chauvinism will come out in his attacks on Hillary if she is the nom, even more women will be alienated from him. Trump can’t win in a General Election for the very reasons that he is winning the GOP race so far. Only a hateful demagogue could prevail in today’s GOP and such a candidate will be far too toxic to win in a GE.